John was born in 1875 in Southampton, his parents were John Wright Sterry – born in Rotherhithe 28th September 1836 and his mother was Ann born in 1841. In the census of 1881 John Wright Sterry was recorded as being a shipping clerk, he died in 1894 in Hampshire, his mother Ann (1841) was born in Spitalfields. They had 3 children Ann J(1869)Gertrude M (1870)John J(1875) and Florence M(1872) all the children were born in Southampton.In the 1881 census they were living at 2 Improved Dwellings.Chantry Road.St.Marys. By the 1891 census John junior was working as a bakers boy, Gertrude was a teacher, (father) John was still a dock clerk and they had moved to 44 Clifford Street. In 1911 census John Joshua was living at St.Michaels House. St.Michaels Square. Southampton, and was working as a dock labourer. John married Ann Ratford (1867) in Southampton. His sister married Mr Loveday and on Johns’ death she was living at 78 St.Mary Street. Southampton, she was informed of his death. John enlisted in the Hampshire Regiment at Winchester and served as a Private. He was killed on 17th January 1915 while in action at Flanders, he is buried in Lancashire Cottage Cemetary in Belgium, grave reference II.E.5. 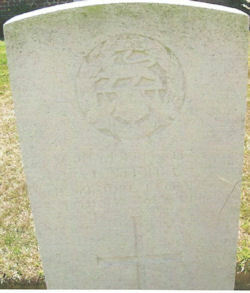 Photo of headstone kindly permitted by Find a Grave.